Blogtown: Get A Tattoo On Abbot Kinney - Meet Royal Heritage Tattoo & Piercing, Now Open In Venice! 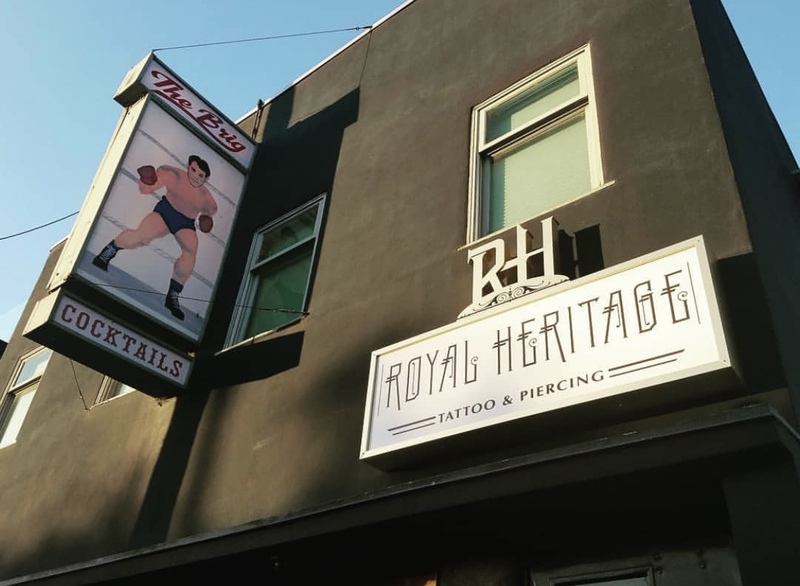 Get A Tattoo On Abbot Kinney - Meet Royal Heritage Tattoo & Piercing, Now Open In Venice! I got a call a couple months ago from David Paris, who owns The Brig building. 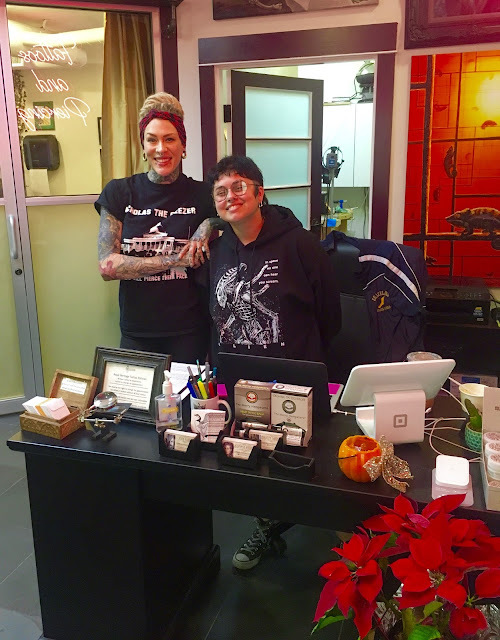 He wanted me to know about a tattoo shop that was opening upstairs from The Brig, and to introduce me to Stephanie Anders, the proprietress of Royal Heritage Tattoo & Piercing. Now, a tattoo/piercing parlor is exactly what Abbot Kinney Boulevard needed - what Venice needed, really, instead of yet another b.s. corporate entity. It took a minute for Anders and I to be able to sit down and chat, mainly because she was being flown to London to do piercing for Victoria Beckham (so she's got great referrals! 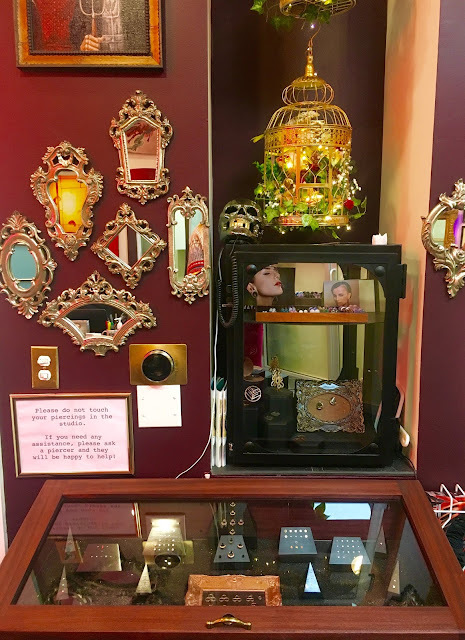 ), and then it was the holidays, and then we finally sat down to talk in her very cool shop. Anders, like myself, was another Mid-Westerner who always knew she was going to be heading out west. Born and raised in small-town Iowa (her graduating class was 9! ), Anders found an interest in piercing when she was only in second grade. She doesn't really know where the influence came from, just that she was always attracted to piercings. In high school, she got a job in a tattoo studio an hour's drive away, building her career and client base as she went. When it was time for college, Anders went and soon realized that she had left a good, blossoming career in order to be a full-time/broke student. Why? Understanding that she had already found her path, Anders left school and returned back to her career, soon being invited to join the best studio in Des Moines, 5 Point Studios. She did get a husband (Kevin Anders, a chemist!) 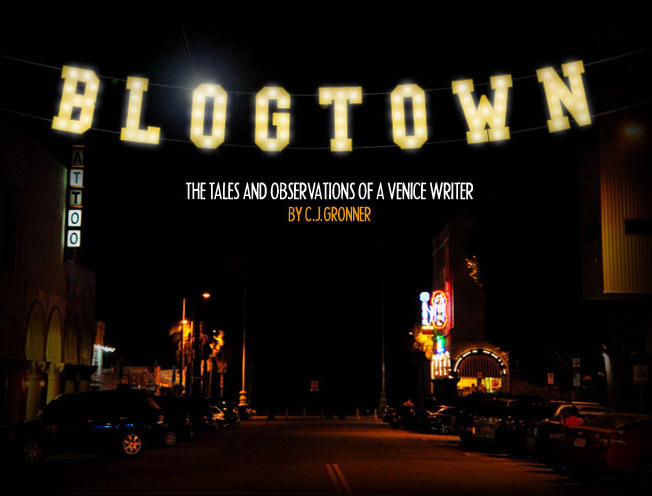 out of college, though, and he had spent some time living in L.A. ... and wasn't mad at the idea of returning. In 2012, Stephanie and Kevin made the move from Iowa to Los Angeles, with no jobs, no place to live, just chasing the dream. A mere few days later, Stephanie got a job at Prix Body Piercing & Tattoo, on Sunset Boulevard at the time. 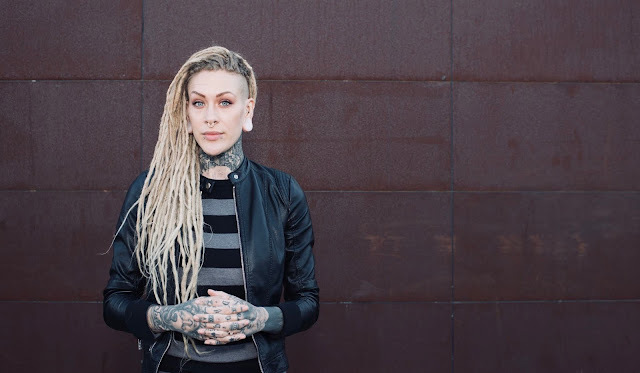 While building up her west coast clientele, Anders had a piercing client, Zulu, who owned Zulu Tattoo at 3rd and Crescent Heights. When she shared with Zulu that she really wanted to open her own studio, he up and offered for her to take over Zulu! This was in 2016, Anders was only 23, but she went for it. The Zulu artists stayed, and soon Royal Heritage Tattoo & Piercing was off and running. Anders kept renowned tattoo artists like Adam Kilss, and now has four tattoo artists working at Royal Heritage (and they're looking for more! ), and 3 piercers including herself. Word of Anders' expertise soon spread around celebrity circles, and she found herself making holes in such celebrity skin (Hole song, get it?) as Charlize Theron, Gwyneth Paltrow, Jennifer Aniston ... you name it and she's probably pierced them. Anders likes to use high-end jewelry for her work, and set out to make her own, launching Royal Heritage Jewelry as the studio continued to grow. They needed a bigger space. Poring over the real estate listings, Anders saw an interesting one on Abbot Kinney and decided to take a look. When turning right on to Abbot Kinney from Venice Boulevard, she saw palm trees and murals and sunshine and good looking people, and was like, "What is THIS place?!" She had never been to Venice other than the Boardwalk (! ), but knew immediately that this was where she wanted to open up shop. "I needed to be here. For myself ... for my studio ... it just felt different than the rest of L.A. ... like there was a community here." She told Paris immediately upon seeing the space that she'd take it, and then hoped that he'd say yes to a tattoo shop upstairs. Which he did, and is cool for doing. They clicked over her being a Mom & Pop for him, and for Anders, him telling her that the Venice Resistance used to meet in this space, and that she felt community like she hadn't felt before out here. I told her, like everyone does, that she would have REALLY loved Venice back in the day, but I felt good that as a newcomer, she had felt what we all felt when we moved here long ago ... still. It's good when new people try to adapt to the place, and not try to force it to be how Brentwood-style they want it (and those people know who they are). Anders is all in for our community too. I was telling her about the upcoming Venice Mardi Gras parade at the beach, and she instantly was all excited ideas about how to participate - "Ooh, we can make Royal Heritage beads to throw out!" I like her style. Anders handled the remodel, which took most of September, and Royal Heritage opened for biz on October 18th, 2018. Many of her clients followed her here, as did her other artists' clients, plus a whole lot of good word of mouth has spread from their solid 5 star reviews on Yelp, so they've been busy at work ever since. 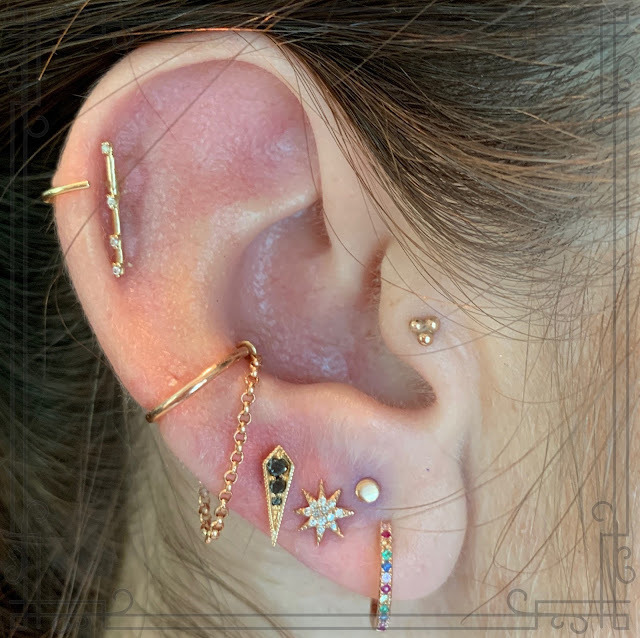 Anders is making jewelry, piercing clients, hosting piercing parties, being flown around the globe to meet her high-end clients' piercing needs, and it seems like she's having a blast and loving living her dream. Everyone at the studio is super nice and welcoming, and the work is the height of professionalism. 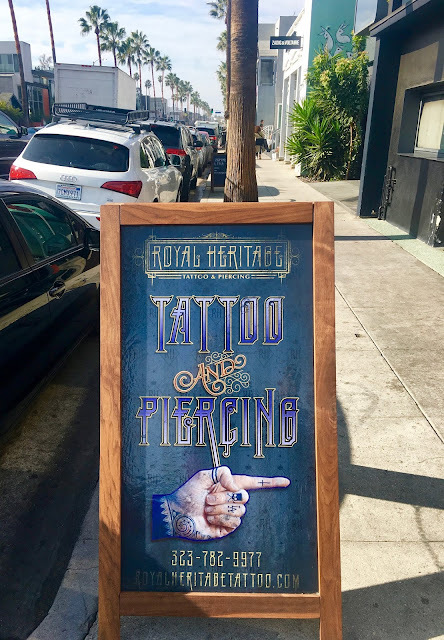 My brother and I were in Tijuana a week ago, and almost got margarita-induced tattoos, but I'm glad we didn't and now can give Royal Heritage a go once that wild hair returns. Filling Anders in on happenings around Venice, she told me, "Any way we can be involved in things, we want to do it." If only all our new businesses and neighbors were so helpful and agreeable ... that Venice IS and MUST remain, a special place to live and work and love and have FUN. "This is a creative environment ... that's what brought me here," explained Anders, in accordance with what brought most people here (before greed for the dollar took over). Anders and her co-workers work a lot, so they still have a lot of Venice to explore, but Abbot's Pizza remains an almost daily go-to that they can run out up the block and grab a quick lunch. They also got very familiar with Lincoln Hardware during their build-out, and love that place too. The Brig is an obvious favorite, as customers tend to think of new tattoos downstairs while drinking, and come on up (not unlike my brother and I in T.J.). Note that newcomers also dig the neighborhood joints that we all know and love, not the corporate chains that no one wants here, save for greedy landlords. We all know how I feel about that, and it's nice to see the sentiment shared by people just now discovering our fair town ... Love for the REAL Venice. "We want to be a high-end studio that caters to anyone who needs us. There are options for everyone to have a high-end experience. I'm just really happy and excited to be over here, and to be the best that we can be," shared Anders. Her enthusiasm is as infectious as her smile, and Royal Heritage is a most welcome addition to the block that sorely needed this infusion of real deal cool, not the kind that marketing teams deem so. Happy to have you here, Stephanie and Royal Heritage! Welcome! great reporting as usual . welcome to the neighborhood royal heritage !